Norwegian Bliss is the newest cruise ship in the Norwegian Cruise Line fleet, an advancement of the Breakaway Plus class of ships, with many unique features, despite her outward appearance matching that of sister ship Norwegian Joy. Here are the five key ways Norwegian Bliss is different to the rest. Norwegian Bliss’ Observation Lounge sits directly above the bridge, offering exceptional views at sea. Norwegian Bliss has what NCL president and CEO Andy Stuart calls the ‘most outward looking design’ of any of the Breakaway or Breakaway Plus class ships. As part of this, it features the popular Waterfront on Deck 8, but also an Observation Lounge way up forward on Deck 15, with spectacular views over the bows. It is the largest Observation Lounge on any cruise ship, according to Stuart, though he also readily admits that this fact has not been independently verified. The racetrack aboard Norwegian Bliss has been marketed as the largest racetrack at sea, but in truth there is only one other feature of its kind in the industry, aboard Norwegian Joy. This track is 40% longer than Norwegian Joy’s, with 1,000-feet of tarmac around which electric go-karts race in near-total silence. For the drivers, however, the action is kept alive with artificial combustion engine revs played through speakers in the headsets. 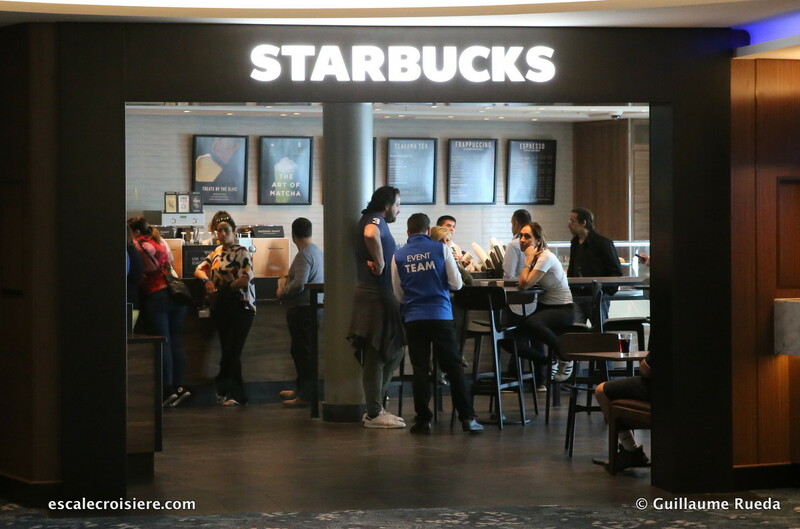 Although Starbucks has been served aboard Norwegian Cruise Line ships for several years, Norwegian Bliss has the first full-fledged Starbucks outlet on-board. The Starbucks aboard Norwegian Bliss is the cruise line’s first full-fledged branch of the coffee shop. (Image courtesy Escale Croisiere). Located just off the main atrium on Deck 6, it serves all the most iconic Starbucks beverages from Lattes and Frappuccinos to chai teas and hot chocolates. The snack menu is more limited though, with just three types of cake on offer (Lemon Pound Cake, Coffee Cake and Banana Bread). RELATED: When will Norwegian homeport out of Dubai? The two-deck Haven area aboard Norwegian Bliss is larger than that aboard any of the other Breakaway Plus cruise ships. It comes with its own bar and lounge, restaurant, indoor pool area, and a palatial two-level observation lounge that sits atop the Garden Café Buffet. Haven residents have better views over the bow than even the captain. The Haven area is dominated by the two Owner’s Suites forward on either corner of the front of the ship, each with a commanding view and sweeping balconies. With an open-air laser tag course, two multi-story waterslides, and a two-level electric race track, Norwegian Bliss is jam-packed with novelty entertainment options. But, it is also the first ship in the fleet to feature the original Broadway-style production iHAVANA!, a theatre show set in the city from which it takes its name. Image courtesy Ocean Liner Pictures. The show is led by Tony Award–winning director and choreographer Warren Carlyle and is a celebration of Cuba’s music and culture, journeying back in time to its 1950’s heyday. Set at The Palace of Lights, where backstage intrigue combines with seductive rhythms and sultry dance moves, it comes from a team of Broadway creative powerhouses, including famed Cuban-American design duo Ruben and Isabel Toledo, creators of the spectacular set and vivid costumes.